Welcome to Manda's Rhythm & Dance! Your child is precious and we know that choosing the right place is a big decision! From the moment they skip into class, smiling from ear to ear and twirling in their tutu, your little one will fall in love with dance. Watching your child blossom with confidence as they explore their creativity, they will adore learning to dance and dancing to learn. With classes that educate and delight, our teachers will cherish your child’s progress and nurture their happiness. From the moment you are welcomed into your first class, you’ll see your child cared for and celebrated in a whole new way. We believe children are precious and we are passionate about opening a door to a whole new world of dance! We serve Clinton Township, Harrison Township, Fraser, Warren, Sterling Heights, Macomb and surrounding areas. 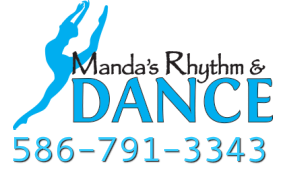 Feel free to stop in and see what Manda's Rhythm & Dance is all about or call our office at 586-791-3343. Come check out our newly expanded studio with spacious lobby, closed circuit television, Wi-Fi, play area, changing rooms, and homework bar! What People Are Saying About MRD! ​We'd love to speak with you about what class would be best for your dancer! Click here to contact us!